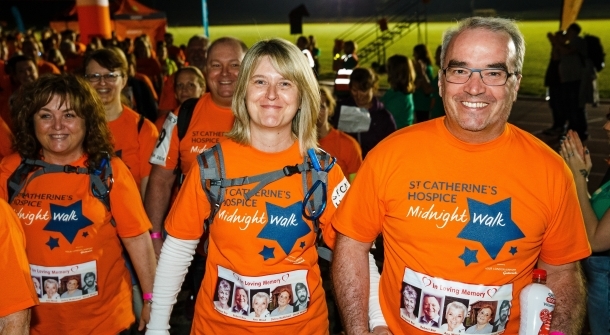 Dust off your trainers and gather your friends because St Catherine’s Hospice Midnight Walk is back! Taking place on Saturday 8 June at Broadbridge Heath Leisure Centre, this event gives people the chance to walk in support of their local hospice or in memory of a loved one. For the very first time, this event is open to walkers of all ages and abilities, with a brand new 2 mile route added so the whole family can get involved. Sponsored by Gatwick Airport, the walk offers a choice of 2, 7, 13 or 20 miles. Last year, over 1,100 people walked through Horsham, lighting up the town with a brilliant orange glow. This year, St Catherine’s is hoping even more of you will join them and make your steps count for your local hospice. St Catherine’s can currently only reach 1 in 3 local terminally ill people, and their families, when they need them most. With the support of people like you, they can be there for everyone when life comes full circle. It doesn’t matter whether you’re walking individually or as a group, for the first time or for the tenth time, as a personal challenge or in memory of someone. It just matters that you walk. Let’s go further, together – sign up now. or call St Catherine's Events Team on 01293 447355. Make sure you sign up by 5pm on Sunday 21 April to receive a special early bird entry rate of £10. After this date, it'll cost £15 to take part. All entry fees include a free T-shirt, finisher's breakfast and medal.